I enjoy Gazpacho. It is great on these hot, steamy humid days with a lovely glass of rosé or Albariño. I often see it on the menu and I'm usually disappointed when I order it, like last night. I like mine to have a little bit of chunkiness to it. However, it is usually all pureed. I understand because it is easier just to puree it all instead of chopping and dicing. Gazpacho is a traditional dish from Spain that spread to Portugal and Latin America. They all have their own variations with adding bread or avocados and even omitting the tomatoes and having more fruit based like watermelon. They traditionally use a mortar and pestle instead of a blender of food processor, which cause the puree to foam a bit, and a sieve for the tomatoes to get the seeds out. It is great summer soup because it is a soup served cold and the acidity of the tomatoes add to the refreshingness of it. There is some prep work with dicing and chopping. Or you can just throw it all in the food processor until completely pureed. Your choice and it is worth it either way! To make the soup as rich and flavorful as you can, use fresh tomatoes from your own tomato plants or gather some up at a wonderful local farmers' market. Canned tomatoes can be more flavorful than many fresh ones you buy in your regular supermarket. Check out this article on tomatoes. Letting it sit longer also enhances the flavor of the soup, a minimum of 2 hours but t is still spectacular days down the road. 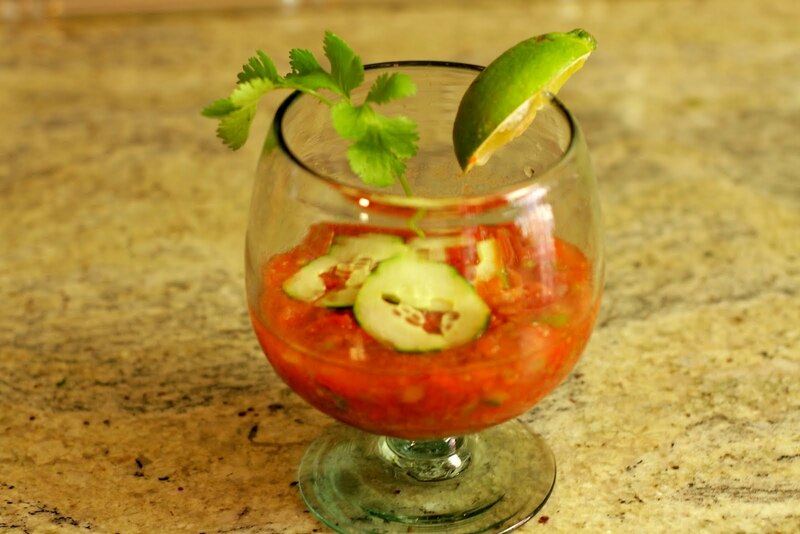 Mix the celery, peppers, onion, garlic, cucumber, cilantro, and 3 of the chopped tomatoes in a large bowl. Using a regular or immersion blender or a food processor, puree the can of tomatoes. Add half of the veggie mixture to the pureed tomatoes and pulse about 5 times for 3-5 seconds each time. Add the remaining mixture and pulse another five times. Continue to blend until you get your desired texture. Pour into a bowl and mix in the tomato juice, remaining chopped tomatoes, vinegar and oil. Add salt and pepper to taste. Chill in refrigerator for a minimum of 2 hours, preferably overnight. Serve with cilantro, lime wedge, avocado and/or cucumber slices. What a great reminder of a great recipe!!! Farmers market on Saturday and Gazpacho for dinner!!! We're on it. OK, 102 out here on Oct 11. Making it again. So good! Cherries - Probably my favorite summer fruit!